Oak Park/River Forest is a world class tourist destination, drawing over 100,000 cultural travelers yearly to see Wright's architecture and the Hemmingway childhood home in a historic 20th century village. As residents we share the trains from Chicago with our guests clad in gym shoes, backpacks and carrying cameras. Unfortunately, the vast majority of our guests come for daytrips and do not stay overnight in one of our hotels or guest houses. Two recent events may create opportunity for the hospitality business in Oak Park. One, the selection of Unity Temple as a World Heritage Site will certainly build on the substantial cultural traveler. Two, the proposed high-rise project at Lake and Forest will not contain a hotel. This should make the local hoteliers more confident that their properties will remain competitive and relevant. The timing is right to consider how to better accommodate this projected growth and potential business. Ian Schrager, the creative inventor of the 'Boutique Hotel,' including the Royalton in New York, the Delano in Miami and the Mondrian in Los Angles, has whipped up some magic in Chicago. The iconic Ambassador East Hotel built in 1926 and its legendary Pump Room have recently opened after a carefully executed restoration and renovation of the property. I am happy to report that we now have a hotel oozing with cool in Chicago named PUBLIC Chicago. 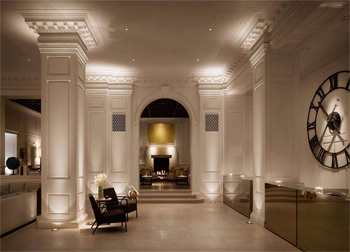 Schrager and his team have created a new breed of hotel, one that is inclusive with a preview rate of $135 per night. Yes, that's right $135! But the repositioning of this historic property and how it was done is the story. PUBLIC, Schrager argues, "is a new class of lodging responding to the stagnated, anachronistic and sleepy hotel industry that has become predictable, banal, conformist, marbleized and computerized." The goal is to bring back the idea that a hotel is the center of activities for traveling guests and residents in the neighborhood. The original entrance has been updated with a pair of welcoming gas torches leading to the white neo-classic stair hall. At the top of the stairs the color and materials scheme is revealed completely natural with the original classical columns illuminated by up lights recessed into the limestone floor. The polished stainless steel registration desks recall the 'bean' in Millennium Park. A monumental antique train station clock is mounted behind the desks reminding us that most guests arrived via trains in the 1920s and '30s. Up a few steps to the paneled library we are greeted by a roaring fire filled with comfortable modern furniture and original painting, designed as a coffee house for morning use and transformed into a bar in the evening. Schrager's term "Lobby Socializing" is apparent in the comfortable room suitable to see and be seen. A surprise candlelit Backroom doubles as a screening room for films in the evening and cartoons in the morning, furnished by low lounging sofas. On the opposite side of the lobby the bar is framed by a monumental cove with a sensuous white gold finish. The lounge overlooks the Pump Room with its array of custom globes providing lighting for the fabled room. The design is minimal, understated and respectful to the history of the Pump Room. Perhaps the celebrities, movie stars, athletes and politicians will come back to what is now the coolest place in town. I understand Michael Jordan has been hanging out. Oak Park/River Forest deserves an inn that attracts tourists and a place where residents can put their friends and family when in town. The PUBLIC Chicago is an exciting example of what a creative historic renovation can produce. Oak Parker Garret Eakin is an architect, a preservationist and an educator.